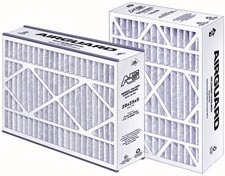 Research Products Corp makes the Aprilaire® filters, which used to be sold under the Space-Gard brand name. Our Aprilaire brand of replacement media is the best to use for both Aprilaire® AND Space-Gard Media Air Cleaners. This filter utilizes an effective HEPA-type filtering media that actually improves its particulate-capturing capability the longer it is used. For particles larger than five microns, efficiency reaches 99%. Even the smallest particles, as small as one micron, can be filtered out at 95% effectiveness. The high-density filter unit is attached to your existing heating or cooling system, where it captures pollutants from conditioned air before it is distributed to the rooms of your home. 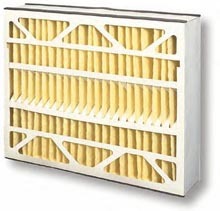 We now offer a generic filter replacement option for the Trion Air Bear filters. These cartridges are an exact replacement and require no modifications. Fedders Corp makes the Trion Air Bear whole-house media air cleaners to be much more efficient than ordinary disposable type furnace filters. In fact, Trion Air Bear media filters consistently perform well due to their highly efficient synthetic material, featuring extended-surface pleats that have a higher dirt-holding capacity than similar filters. F25 Replacement Filters The popular Honeywell F25 media filter has been replaced by the new Honeywell F100 series media filters. Fortunately, you can use the new replacement filters for the FC100A filter in your old F25 cabinet. F50 and F52 Electronic Air Cleaners If you are tired of cleaning your electronic cells every month, you can easily switch to the replacement media cartridges listed below by turning off the power on the power head, removing the aluminum pre-filter and electronic cells, then installing the matching media filter for your size cabinet. Generic Replacement Options We only offer a high quality generic filter replacement from Air Guard for the Honeywell filters. The cartridges are an exact replacement and require no modifications. The replacement filters are rated at MERV 8.